Flacks will always try this on. Resist. 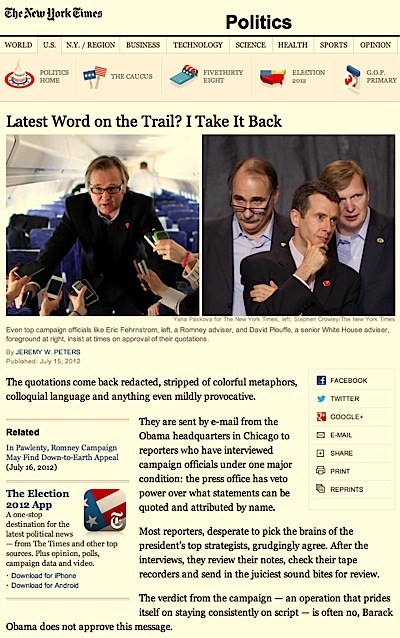 The New York Times reports in a vaguely-nauseating article ‘Latest Word on the Trail? I Take It Back‘ on the increasing use of ‘quote approval’ by the US presidential campaigns as a condition of interviews with people associated with the campaigns. An interview can be an adversarial event, or a collaborative one. But giving your subject a right of veto over any part of your article (as opposed to fact-checking) is a ludicrous loss of posture. It also severs the fair expectation of truthfulness our readers/audience have a right to expect.